Since September 2017, you have worked tirelessly to collect and ship to Ghana musical instruments worth over fifteen thousand Canadian dollars (CAD $15,000.00). Your determination and resilience in surmounting the many obstacles in the process of your organisation's charitable activity in aid of Musical Education in Ghana is exceptional, admirable and commendable. 2. 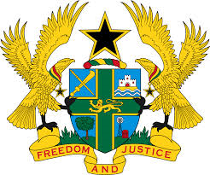 On behalf of the Government of Ghana and in my own name, I wish to express profound appreciation to you and your spouse as well as to Instruments For Africa for the donation made to the Ghana Symphony Orchestra and twelve (12) schools in Greater Accra. 3. The Mission looks forward to further collabortaion with Instruments For Africa in aid of music education in Ghana. 4. With renewed assurances of my high esteem. 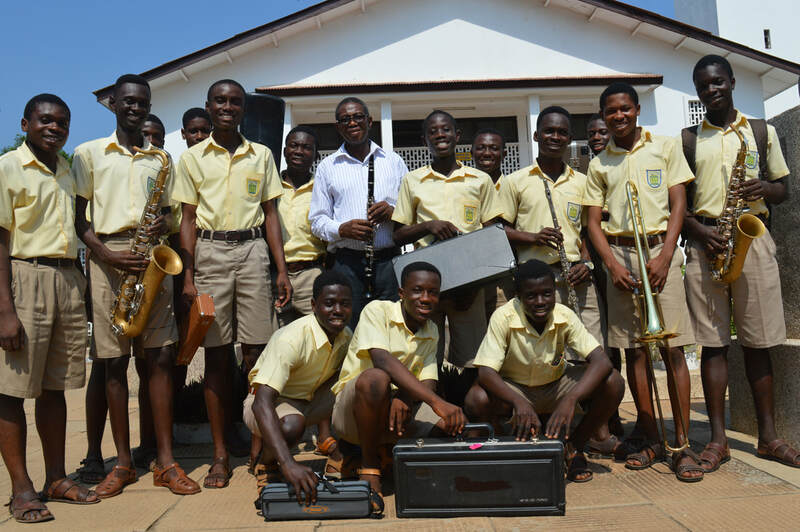 I am pleased to report that Instruments For Africa has returned from our very successful, first-ever trip to Ghana, where we delivered instruments to fourteen schools and institutions. Our first stop was the School For The Blind in Akropong, about fifty kilometres north of the capital city of Accra. Just before we departed Canada we started a last-minute funding drive for this school and we raised enough funds to purchase 200 recorders, to which we added a donated keyboard, all of it brought to Ghana in our checked luggage. With two dozen of the school’s four hundred students gathered around I officially handed over the donation to the Headmistress, but I couldn’t resist actually handing some the brand-new recorders out to the smiling students who pressed in excitedly with their hands extended. Soon the grassy square was a beautiful cacophonic blur of happy random notes and whistles, but in no time at all snatches of real, thoughtful music began to emerge from the din. After the handover presentation we walked to the school’s sparse music room where several students took their places at two keyboards, a drum kit and several microphones and we were treated to fifteen minutes of wonderful, inspiring music. Clearly these kids will make great use of the instruments we left with them! After the inevitable yet unfortunate delays that we always seem to encounter, our 2,700lb shipment of nearly 200 instruments, more than 600 music books, and countless accessories was finally released from customs. Everything was rushed to the Accra Senior Girls High School where we unloaded the gear into the school’s auditorium and sorted it into carefully pre-selected piles. In a stroke of efficiency, the Ministry of Education had arranged for all the schools to come to the auditorium where the donations could be officially handed over and dispersed all at once. At the appointed time hundred of students, music teachers, headmasters, and Ministry officials crowded into the large hall and collectively received their instruments. We spent our brief remaining time visiting as many schools as we could, and though we weren’t able to visit all of the donees we were very happy to see how engaged the music programs were in the institutions we did manage to tour. We hope to be back soon for a follow-up trip when we will be sure to visit all thirteen schools. Shortly after we arrived in Ghana we had dropped in unannounced at the National Theatre and found the members of the National Orchestra in the middle of rehearsal. We introduced ourselves to Isaac Annoh, the orchestra’s longtime conductor. It was clear that the orchestra’s modest instrument collection was in dire need of upgrading; indeed, some of the high schools we were donating to would soon be better equipped than the country’s national orchestra! More importantly, Mr. Annoh told us that if he could get his hands on some half- and quarter-sized violins he would be able to realize his dream of starting a youth orchestra. 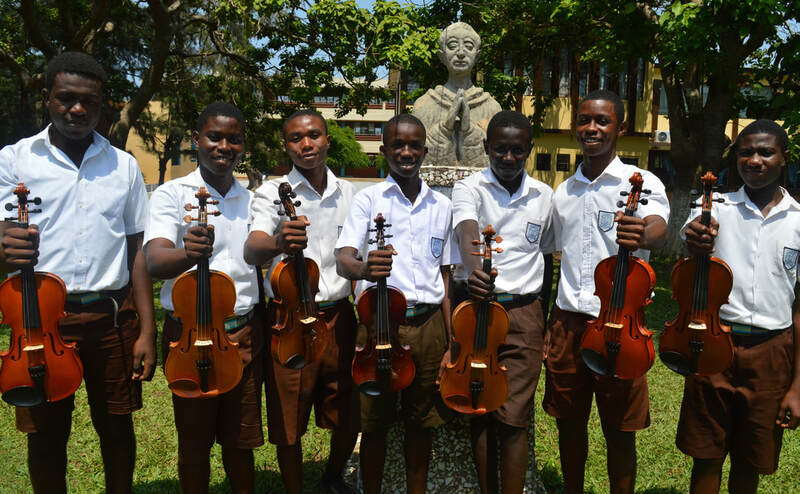 His enthusiasm was palpable; he would have the more talented students in Accra bussed to the National Theatre several times a week where they could be mentored by current orchestra members. ​Inspired, (and with the blessing of Ghana’s Ministry of Education) we skimmed a few things from our other donations and created an extra instrument pile consisting of five junior-sized violins, a 'cello, three flutes and a clarinet, a French horn, a trombone and four trumpets, a large stack of scores and theory books, plus a huge supply of reeds courtesy of The D'Addario Foundation. In the end we almost doubled the orchestra's instrument collection, much to the thrill of Mr. Annoh. Though the core of our organization consists just of myself and my wife Heather, any success Instruments For Africa generates is the result of the work and generosity of hundreds of people. We would very much like to humbly thank everyone who helped to make this delivery another such success, starting with High Commissioner Otoo and his Deputy Minister Mr. Johnson at the Ghana High Commission in Ottawa, both of whom were instrumental in clearing the path for this shipment. On the ground in Accra we received the help of many people, but none more than the Director General of Administration at the Ministry of Education Mrs. Asamoah and her staff, who provided transportation, advice, support, and information at every turn, and they deserve much thanks for all of their patient assistance. We’d also like to thank our good friends at Musicare back home in Ottawa, who serviced all of the band instruments that came through our door and donated several of their own, and also Dave Skippen for working so hard repairing all of our stringed instruments. We’d like to thank The D’Addario Foundation, who donated countless boxes of reeds and strings that will keep the instruments in playable condition for years to come, and we would also like to thank both Sennheiser and the Ernest E. Guertin Foundation for their financial support. Instruments For Africa would further like to thank Danielle and everyone at Metro Music for their endless assistance and we’d also like to thank the staff at both Lauzon Music and Spaceman Music. But most importantly, Heather and I would like to thank all of the individuals who kindly and generously donated their own, well-loved instruments and music books for the children in Africa. Every bit of help big and small has added up to great things, and though the impact of your gift can never be measured I can promise you that the impact is very real. I’ve seen it with my own eyes. We’re excited to announce that our most recent donation is currently on its way to Ghana. Right now the ship is somewhere between Morocco and Accra; 2,700lbs of books, accessories, and amazing musical instruments, all donated by people like you. We managed to seperate the equipment into twelve groups, so we’ll be able to supply twelve schools with instruments when we arrive in Ghana next month. The problem is, several months ago the Ministry of Education in Ghana gave us a list of thirteen schools in the country that need our help, and no matter how we tried we couldn’t stretch our instrument collection far enough to equip all thirteen schools. We left it up to them to eliminate one name from the list and the school they selected to not receive instruments from IFA on this trip was the Accra School For The Blind. We’d like very much to include the Accra School For The Blind and we could use your help. Recorders are very popular instruments with kids of all ages everywhere we go in Africa, and our friends at Musicare have agreed to supply us with as many good-quality, brand-name recorders as we want for just $5 each, tax-in. Our flight tickets allow for three more pieces of luggage than we require so we could potentially take hundreds of recorders to Ghana with us without any shipping costs whatsoever. This means you now have the unique opportunity to put an instrument directly into the hands of a handicapped child in Ghana for a mere $5. Aside from being relatively easy to play, very durable and always staying in tune, the best thing about recorders is that unlike a trumpet or a guitar that is shared by many students, every child gets their own recorder to keep. With your $5 donation I will personally be able to hand a recorder to one of these children, one they can take home and keep as their very own. Imagine the difference that could make! How often do you get a chance to make that kind of difference for such a tiny sum? If you donate $10 we can give instruments to two kids. For $100 we could give the gift of music to an entire classroom! But the point is, for the extremely reasonable price of just five dollars you can be directly responsible for giving a ray of musical hope to a child in Ghana. Please, click the donate button above this article right now. Simply write the word “recorder” in the instruction box and we’ll make sure a child at the Accra School For The Blind receives your gift. Instruments For Africa is thrilled to announce that our latest shipment has left Ottawa and is officially on it’s way to Accra, Ghana! It’s may not look like much, but these two crates measuring 7’ x 4’ x 4.5’ and weighing in at a combined total of 2,700lbs contain the collective effort and kindness of hundreds of people. They also contain 148 musical instruments and almost 650 music books and scores, not to mention countless drumsticks, guitar, bass, ‘cello and violin strings, music stands, tuners, metronomes, mouthpiece disinfectant, picks, cork grease, and thousands of brand-new saxophone and clarinet reeds courtesy of The D’Addario Foundation. These instruments came from private donations and we would like to extend a humble and heartfelt thank-you to all the individuals who contributed to this shipment by donating your well-loved instruments, accessories and music books, and we’d like to offer a special thanks to the generous people who made financial contributions to our effort. Thank you all so very much. Instruments For Africa would also like to single out Metro Music, Spaceman Music, and Lauzon Music for all of their continued support, Dave Skippen for contributing so much of his time and equipment getting all of our guitars ready for shipment, the staff at the Ghana High Commission for their cooperation, The D’Addario Foundation, Sennheiser Electronics, and the Ernest E. Guertin Foundation for their financial and product donations, and especially our first and most tireless sponsor, Musicare. The very first email Instruments For Africa received when we began our initiative back in 2012 was from Musicare. It was an offer to inspect, clean, and service all the concert band instruments that would be donated to our organization and it’s because of their continued participation that we can be confident that the children in Africa will always find their new instruments in good working order and ready to be played. Not only does Musicare continue to service all of our band instrument donations, they also regularly set aside instruments to donate to our cause. Several trumpets, trombones and three (yes, three!) French horns included in this shipment were donated by Musicare. We cannot overstate our appreciation to everyone at Musicare and all they do for Instruments For Africa. Once again we here at Instruments For Africa would like to extend a heartfelt thank-you to the good people at Musicare. Earlier this week we stopped in to pick up a couple of flutes that Musicare had cleaned and repaired for us only to find that Andrew Abraham and his amazing crew had a surprise for us. Actually, they had a whole lot of surprises for us. In addition to making the two flutes look and play like new, Andrew had collected for us an additional five trumpets and three violins, more than two-dozen music stands, a box full of extra mouthpieces and another full of valve oil, tons of band shirts, several boxes of instructional material and more! We packed the truck to the roof. And this isn’t the first time this has happened, not by a longshot! Once we were picking up a half-dozen trumpets that Musicare had repaired for us and Andrew had nearly ten trombones waiting for us, another time he surprised us with a bunch of French horns. French horns!!! Musicare has been cleaning and repairing concert band instruments for Instruments For Africa since the very beginning and it’s not an exaggeration to say that we really couldn’t do this without them. Add to that all the instruments and accessories that Andrew and the rest of the crew at Musicare has collected and donated to us over the years and, well, we really can’t thank them enough. But we sure can can try: Thanks Musicare! Instruments For Africa is excited to announce that in the coming weeks we will be sending a shipment of instruments to Ghana for the first time and we’re hoping that you can help make this trip even more successful! Since distributing our last shipment of donated instruments to Zambia we have looked forward to expanding our reach once again. After poring through the hundreds of requests for help we have received and consulting with officials at several embassies we are confident that our next shipment can make an impact on the lives of countless children in schools in and around Ghana’s capital city, Accra. Our current instrument collection will equip seven schools in Ghana with much-needed musical instruments and instructional materials but we would love to be able to help even more. With your help, we are hoping that a last-minute instrument drive can generate enough donations to allow us to outfit an eighth school, or even a ninth! Please, if you have a used musical instrument that has fallen out of use would you consider donating it to our cause? While we are pleased to accept virtually any instrument,* at this time we are particularly on the hunt for electric keyboards, electric guitars, saxophones, clarinets, and recorders**. We also have a few violins that are lacking bows, so if you have an extra violin bow or two we could sure use them! Our shipment will be leaving Ottawa very soon! Instrument donations can be dropped off directly at Metro Music (695 Bank Street/closed on Mondays) or you can click here to arrange for a pick up. If you can, please help us help Ghanaian children fall in love with music. *At this time we are unable to accept used harmonicas or acoustic pianos (though we are happy to accept electric keyboards of all types). ​**Yes, recorders!!! In addition to being easy to ship, easy to learn and quite durable in virtually any climate, the recorder is surprisingly popular among children and teenagers alike in every African country we’ve visited thus far. At the end of the 2016-17 school year much-loved music teacher Nick Gummeson left Ottawa’s Elmwood School. Mr. Gummeson has been a generous and vocal supporter of Instruments For Africa since we began our efforts in 2013 so when his students searched for a way to honour their teacher they decided raising funds for IFA in his name would be a fitting farewell gesture. In an assembly at the close of the school year Elmwood student Katherine Keough presented the donation to Mr. Gummeson and we are honoured to accept it on his behalf. We would like to thank Mr. Gummeson as well his thoughtful and inspired students at Elmwood School for their kind, generous support. Your generosity will directly enrich the musical lives of countless children, parents and teachers. Again, thank-you. We would like to extend our thanks to The D’Addario Foundation for their recent product donation to Instruments For Africa. The surprise donation of over seventy boxes of Rico clarinet and saxophone reeds, dozens of tubes of cork grease and several extra clarinet mouthpieces is yet another show of support from this wonderful organization and will help us to properly outfit our next round of instrument donations. A sincere thank-you to everyone at The D’Addario Foundation for their continued support of Instruments For Africa. Instruments For Africa is coming to Kingston! We are seeking used musical instruments and accessories for our next shipment to Africa where the cleaned and serviced instruments will be donated to schools and community centres in need, and we are looking to Kingston residents for help. If you live in Kingston and have a musical instrument you’d like to donate please get in touch with us here. 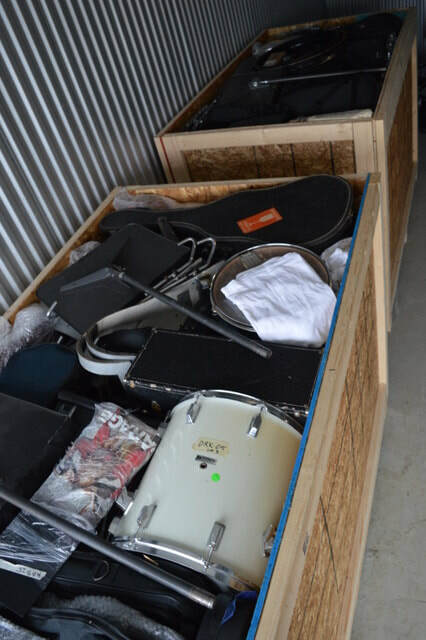 Since 2012 Instruments For Africa has been asking Ottawa residents to comb their attics and basements for used trumpets, guitars, violins, keyboards, recorders and virtually any other instrument they might be willing to donate. While Instruments For Africa plans to make the Kingston instrument drive an ongoing effort Snelgrove is hoping for an initial surge of instruments that can be prepped in time to be included in their next shipment, scheduled to depart this summer. 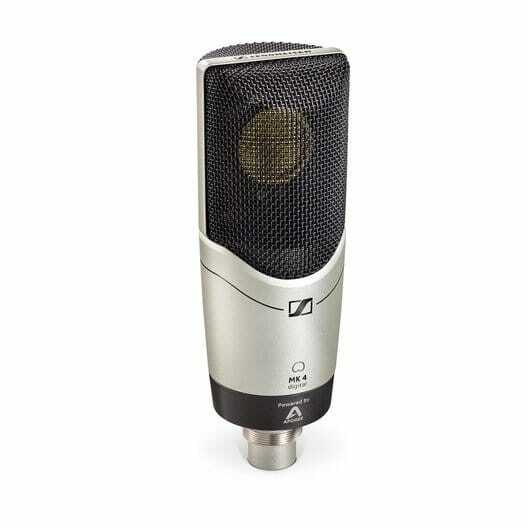 Instruments For Africa would like to extend its appreciation to our most recent sponsor, Sennheiser Electronic GmbH & Co. The generous financial donation we received from the German maker of high quality microphones, headphones, speakers and other musical electronics will significantly expand the size and scope of our next shipment of musical instruments and accessories to Africa. The impact this donation will have on countless students, parents and teachers truly is immeasurable. When we visited the St. John's Secondary School in Mongu, Zambia last October we found the school very much in need of reeds; the concert band had been sharing the school's only two clarinet reeds for years! We left two boxes of Rico reeds with the school and upon our return to Canada we shipped an entire crate of Rico reeds to Mongu with help from The D'Addario Foundation. "I write to confirm and acknowledge receipt of the Clarinet and Saxophone reeds sent to St. John's Secondary School. The Music Section is so excited about this donation. It will for sure go a long way. Mr Lyambela the Deputy Head teacher of our School has also acknowledged your donation. On behalf of the School, he is so grateful. I also wish to inform you most of the pupils who sat for Music junior examinations have made it back to St. John's and have continued to learn Music at Senior Level. Because of your donation, we have now formed an Orchestra Group which is rehearsing three times in Week in the afternoons from 4pm to 5:30pm. I believe that by the time you will visit us once again, you should be entertained by our Orchestra Group, Brass Band and some cool stage band music. Thanks once again to you and the entire Instruments for Africa team for your donation. Extend our gratitude to The D'Addario Foundation for the support they render to your organization." In October 2015 Instruments For Africa returned to Zambia, completing our third shipment of musical instruments and accessories to the country. 139 instruments, dozens of books and boxes of reeds and strings were divided among eight schools and community groups in three cities across the country. In Lusaka we revisited Parklands Secondary School, Twitti School and Lusaka Secondary School to augment their instrument collections while Be In The Band Zambia also had their instrument collection boosted with help from BITBZ sponsor RBC Bluesfest. 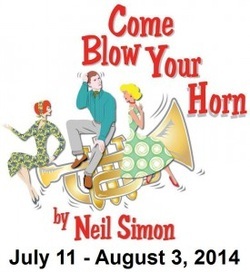 Click the video below to see some footage from one of their recent rehearsals. Two institutions in Lusaka received donations from IFA for the first time. IFA left a small but significant donation with Evelyn Hone College so future music educators can graduate with practical experience on good quality string, brass and woodwind instruments. Another new donee is the Ngoma Dolce Music Academy, a private institution that offers full-time employment to a growing staff of music teachers while offering the widest range of instrumental instruction in the country. The most successful music program we've sposored in Zambia to date is in Livingstone at Zambezi Primary School. Despite suffering devastating hardships including partial paralysis and the recent passing of his wife, music teacher Shaft Sikwa continues to do excellent work with his growing music department. He and his students were ecstatic to add another fifteen instruments to their music room, a donation that included a long-awaited 'cello, finally filling out the school's string quartet. The most rewarding moment of the trip occurred during our first donation in Western Province, at St. John's Secondary School in the capital city of Mongu. When the school was founded fifty years ago a brass band was established, and to this day St. John's Secondary School boasts the only brass band in the entire province. The band proudly wears matching uniforms, practises daily, and is often called on to perform at community functions. After a half-century of constant use the instruments the band possesses are in the worst shape imaginable, held together with nothing but tape, string, and hope. In Canada these instruments would be discarded at first glance, in Mongu they represent the only opportunity to provide music at Independence Day ceremonies and Christmas concerts. While the students were overjoyed with each instrument that emerged it was the box of clarinet and saxophone reeds that IFA received through sponsorship from The D'Addario Foundation that got the biggest cheer. And why would the students get so excited about a few hundred reeds? With two clarinets in the schools collection, the band had been sharing just two reeds for several years. For the first time in living memory each musician can now have his or her own reed. Thank-you to everyone who donated instruments and accessories and to those that made financial donations, continuing thanks to RBC Bluesfest for further sponsoring BITBZ, thanks to the Ernest E. Guertin Foundation for their generous support, and thanks especially to Musicare who does so much repair and assessment work for us. Finally IFA would like to extend a big thanks to our newest sponsor, The D'Addario Foundation. One of our biggest expenses has been related to the acquisition of new reeds and strings and The D'Addario Foundation has helped immensely with a very generous product donation. We are thrilled to announce that The D'Addario Foundation has offered their support to Instruments For Africa in the form of a product donation for our next shipment of instruments destined for Zambia. 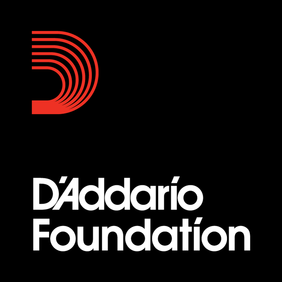 A world leader in all manner of instrument accessories, D'Addario annually sponsors a number of organisations involved in musical education through The D'Addario Foundation and IFA is honoured to be selected this year. We recently unpacked our new D'Addario guitar, violin, viola, and 'cello strings and Rico reeds for clarinet and saxophone. All of this will be included in our next shipment to Zambia. A huge and heartfelt thanks to The D'Addario Foundation for their kind and generous support! International touring artist John Kadlecik and local guitar phenom Lucas Haneman will showcase their talents at Irene’s Pub to raise funds for Instruments For Africa’s upcoming shipment to Zambia. The night of music will be accompanied by a silent auction, featuring items from local merchants and memorabilia signed by artists including Daniel Lanois, Wynton Marsalis, Bobby McFerrin and others. American singer and guitarist John Kadlecik made a name for himself performing the music of Jerry Garcia in the world’s premier Grateful Dead tribute act, Dark Star Orchestra. In 2009 he was recruited by Grateful Dead founding members Phil Lesh and Bob Weir for their most popular post-GD project, Furthur, and with his musical heroes transformed into musical partners Kadlecik spent the next five years on an endless tour of sold-out arena and festival dates helping to continue the legacy of the Grateful Dead. Making his home in Washington, DC, Kadlecik keeps himself busy with a myriad of projects. In addition to performing solo concerts and working with performers like Melvin Seals, Kadlecik is currently touring with the Golden Gate Wingmen, a jamband supergroup that includes Kadlecik, Jeff Chimenti, Jay Lane, and Reed Mathis. The IFA benefit concert at Irene’s will land between two standout shows for John Kadlecik: an appearance at the Peach Festival in Scranton, PA just a couple of weeks before and a set at the Lock’n Festival in Arrington, VA the following week. Kadlecik will be in Italy in October to take part in the annual REX benefit Experimental Residency. While it’s easy to classify Lucas Haneman as a new sensation on the Ottawa scene, in reality the 28-year-old has been playing around Ottawa for almost two decades. While in high school he received the CBC Rising Star Award at the 2005 Ottawa International Jazz festival. In 2010 he graduated from Concordia University with a BFA in Jazz Studies where he received the prestigious Oscar Peterson scholarship. In his short career Haneman has toured across Canada sharing the stage with a host of artists, including Curtis Fuller, David Newman, Guido Basso, Jeff Healey, James Cotton, Sloan, Don Ross, Terry Kelly and David Usher. In March Haneman was honoured with an invitation to London, England to perform at the international Visually Impaired Musicians Live conference. IFA founder and local musician Todd Snelgrove will be returning to Zambia this fall to distribute another 100 trumpets, flutes, trombones, guitars, clarinets, and keyboards to several schools throughout the country. The goal of this benefit concert is to help cover the costs of shipping and distribution of the instruments. We are pleased to announce that Instruments For Africa has just partnered up with UK artist Richard Thorpe and his wonderful RICkuleles! A native of South Africa, Mr. Thorpe started playing the ukulele recently and after searching in vain for an instrument made from an oil can (a common sight in South Africa), the industrious tinkerer decided to build one of his own. And thus the RICkulele was born! His design was so successful he decided to build more and offer the instruments for sale. Media attention including a feature on BBC's Spotlight has brought the RICkulele some well-deserved recognition and now, in an effort to give back to his home continent, Mr. Thorpe has offered to make a donation to Instruments For Africa with each unit sold! Each RICkulele is handmade by Mr. Thorpe from recycled materials and fitted with a pickup so they can be amplified. It takes about two days to make each instrument and the attention to detail is admirable; they sound good and they look great! He currently ships the instruments within the UK. Please visit www.rickthorpe.com for more details. This holiday season give the gift of music! With the season of giving upon us musicians both young and old hope to be lucky enough to find new instruments under the tree; an upgraded guitar, a new flute, maybe even a child's first full-size violin. Often the arrival of these new treasures forces the old instruments into the closet or the basement. Tools that were once loved and cherished begin to collect dust and whither as our new acquisitions get all the attention. Why not take this opportunity to spread the joy of music across the globe? Your old instrument, music stand, tuner, instruction books, scores and other musical accessories can be the gift of a lifetime for so many eager musicians in Africa. When we donate your used equipment to schools and community centres each instrument is enjoyed by dozens of children and communities become empowered as teachers are given the tools they need to teach. This Christmas Instruments For Africa is on the search for instrument donations of all kinds for our next shipment, scheduled for departure early in the new year. We are pleased to accept almost any instrument*, from flutes, trumpets and violas to keyboards and guitars, and everything is cleaned and serviced prior to shipping. If you would like to help please click here to find out how. Don't forget to include your old music books, stands, tuners and other accessories with your donation! *No acoustic pianos or used harmonicas please. Instruments For Africa founder Todd Snelgrove had a very successful and productive trip to Zambia last May, returning with several success stories and buoyed by the opportunity for future successes. With less than three weeks on the ground the schedule was tight; there was a new project to launch, endless meetings to attend, and nearly a dozen schools that received instruments from IFA last year to follow up on. Perhaps the most significant event of the trip was introducing the RBC Bluesfest Be In The Band program to Zambia at Lusaka's Kabwata Cultural Village. The launch of this great program coincided with the celebration of the UN-sponsored World Day For Cultural Diversity, and as the crowds mingled past food and craft stalls amid ceaseless drumming and dancing a small crowd of delegates including the Minister of Arts and Tourism gathered in a small thatched hut for the official opening of Be In The Band – Zambia. As the officialdom moved on the local kids moved in and before long the area was awash in the thunderous sound of children plugging in instruments for the first time. It's clear that the RBC Bluesfest Be In The Band program is going to be hit here at the Kabwata Cultural Village as teachers James 'Chamanyazi' Ngoma and Zenzo Simbao had already signed up eight students by day's end. Traveling through Lusaka and beyond to Monze, Kalomo, and Livingstone offered the opportunity to visit with many of the schools who were recipients of instruments during the first wave of the Instruments For Africa project in October, 2013. While there was a notable range of success each school without question was found to be enjoying significantly increased musical activity. Most schools were successfully on the road to organizing and implementing standardized music programs. At each stop the children were gathered to show off their varying new musical skills, each child with one eye earnestly scrutinising their sheet music while the other eye tried to stay focused on their hand-waving music teacher/conductor. Where teachers were found to be struggling Todd took ample time to steer them in the right direction, sometimes organizing outside tutors for both educators and students and other times partnering more experienced teachers with those with less confidence. The remaining time was filled with meetings with educators, government officials, college and university deans, musicians, sponsors, bandleaders, and an invitation to the home of Dr. Kenneth Kaunda, Zambia's first president and an earnest supporter of the Instruments For Africa project. Instruments For Africa is aiming to have another major shipment of instruments arrive in the area in early 2015, and the success of this recent trip points to even greater successes for IFA going forward. As we traveled throughout Zambia in 2013 one of the most passionate and dedicated people we found was the head of the music department at Linda Secondary School in Livingstone, the school where Instruments For Africa began. Chipo Namaiko is an energetic and talented educator who managed to build an award-winning music program and earn the respect and admiration of his students despite working within a depleted and sometimes frustrating educational system. After years of hard work and sacrifice Chipo (whose name means “wish”) is currently enrolled in a two-year music education program in The Philippines. His dream is to return to Zambia with his masters degree and work towards improving Zambia's music curriculum at a national level. He is getting straight A's in his studies but the fees are putting pressure on his wife and children back home. While it is not in our mandate to help out individuals financially we find Chipo's story engaging and we'd like to give you the opportunity to help. If you'd like to make a financial donation to help Chipo complete his master's degree you can click the button above to donate. Be sure to write “Wish” in the comment box and we'll send 100% of your donation directly to Chipo in The Philippines. We are pleased to be making our first delivery of instruments to the Democratic Republic of the Congo, where an NGO called the Fédération de Femmes Pour la Paix et le Développement (FEPADE) operates a music school with a current enrollment of 67 students, both male and female, who take classes in singing, basic music theory and basic guitar skills from a group of seven volunteer music teachers. Located in South Kivu province of DRC, FEPADE works to improve the living conditions of communities in an area that has been severely affected by conflict. We think that FEPADE's music school is a very worthy initiative and IFA is pleased to support it. While the school currently has access to a piano, some small percussion instruments and a few guitars, with help from Instruments For Africa they will have enough equipment to fulfill an enrollment goal of 200 students next year. We are eagerly seeking instrument donations before April 25th so they can be included in our shipment to DRC. If you've been thinking of donating now is the time! This school is struggling to make a difference among people that have had most of life's opportunities wrenched away. One more clarinet, trumpet, or guitar may just have a real and direct impact upon dozens of lives. IFA is excited to announce that we have partnered with Ottawa's RBC Bluesfest to bring their popular Be In The Band program to Lusaka, Zambia. Be In The Band gives young musicians an opportunity to rehearse and perform together under the tutelage of local professional musicians utilising traditional pop instruments like electric guitars and basses, drums, keyboards and vocals. Kids get practical lessons on how to put together and present a set of quality music with their peers at their side. And if that isn't enough, Ottawa's Be In The Band participants get a chance to play onstage at the RBC Bluesfest in front of a real crowd on the last day of the festival! The Arts & Culture Council in Zambia have committed to the project by securing a rehearsal space in Lusaka and acquiring funding to hire teachers for the program. We are very encouraged at the level of support the Arts & Culture Council is putting behind this project; their dedication can only bolster the success of Be In The Band in Zambia. With the seed of this idea in mind, we met with several musicians and teachers the last time we were in Zambia to gauge who might be interested in getting involved with this program, and we can happily report that there are several very competent and eager musicians ready to get started. The current schedule is to launch the program in Lusaka in May, 2014. 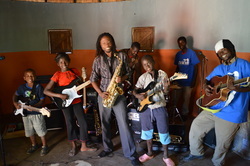 While bands enrolled in Ottawa's Be In The Band program tend to gravitate towards styles ranging from rock & roll to heavy metal, in Zambia the kids will be playing their own local styles. Though the origins of kalindula are debated, there's no doubt that the melodic, electric style is prevalent in many parts of Zambia. There's also an electric style of music indigenous to Zambia called (what else?) Zamrock. Somewhat similar to the Jethro Tull/Jefferson Airplane era prog-rock genre Zamrock is sure to make it's way into Lusaka's Be In The band program. No matter what they decide to play we're glad young musicians in Lusaka will have the opportunity to take part in this amazing program. Be In The Band will offer a unique experience to countless kids who have very few other creative outlets available to them. 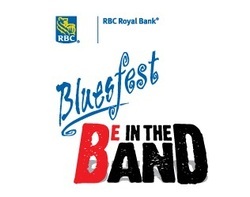 Instruments For Africa would like to thank RBC Bluesfest for their support in this initiative. Instruments For Africa began just over a year ago with an idea to collect a few dozen instruments to send to the Linda Secondary School in Livingstone, Zambia. Overwhelming response brought in many more donations than we were expecting, and in October, 2013 we delivered over 200 instruments to eleven schools in Zambia and Namibia! Guitars, ukuleles, recorders, keyboards, violins, accordions, and concert bands, schools received instruments and accessories like strings, reeds, and music stands, and each school also received a wealth of music books and scores. Hundreds of students that were enrolled in music classes now have actual instruments to play in school, many of the kids seeing saxophones and clarinets for the first time despite studying music theory and singing for years. It was such a privilege to see the genuine excitement and uncontainable energy of the students when they set eyes on the instruments. It was impossible to keep the gear out of their hands as each child seemed automatically drawn to pick up one instrument or another, some strumming manically on acoustic guitars while others put together saxophones and trombones almost intuitively. And the teachers! Some wiped away tears, some jumped up and down barely able to contain their excitement. “Finally, we’re actually going to have a real band!” they would exclaim, obviously as excited as their students at the prospect of finally applying the skills they’ve been mutely teaching for years. Being in Africa for two months led to many important contacts that will help Instruments For Africa go forward with even more success. There were meetings with several arms of the Ministry of Education, teachers, education board supervisors, musicians, the Arts & Culture Council, shipping agents, and there was even an invitation to the home of His Excellency Kenneth Kaunda, first president of Zambia. I also met with the dean of the teachers college where every music teacher in the country receives their training. He described our project as "miraculous." The success of these meetings and the steady interest in IFA here in Canada has convinced us to continue this project indefinitely. Instruments are still being collected and arrangements for future shipments are being made. The Arts & Culture Council of Zambia is putting together a board to help select future instrument recipients and we will be looking at neighboring countries to assess spreading Instruments For Africa even further. Which is to say Instruments For Africa still needs your help! Our instrument drive is ongoing, so if you or anyone you know has an instrument to donate please click our How to Help page. Also, expenses like shipping and musical accessories are ever-present, so please click our donation button and give generously! Finally, the instruments have arrived! It's been a long wait but our shipment of instruments has finally arrived here in Lusaka, 34 days late! In the interim we have met with several teachers at recipient schools, members of the Ministry of Education and the Arts and Culture Council, and the director of Ngomo Dolce, Zambia's only full-time music academy. We have also met with many musicians and active members of the local music community and attended a rehearsal by the Lusaka Youth Orchestra as well as a wonderful concert held by the Lusaka Music Society. In short, we have made several important contacts and have cleared the way to make future instrument deliveries easier and even more successful. That said, until today we were in a near-constant state of limbo with regard to actually getting our hands on the instruments that left Ottawa so many months ago. The shipment was held up in South Africa and again at the Botswana-Zambia border, and as the truck lumbered over the deteriorated roads of rural Zambia our confidence in it's arrival continued to erode. With little hope that our shipment would arrive before her scheduled departure Susan rebooked her flight and left two weeks ago, leaving just Heather and myself to wait. As our departure date loomed I managed to extend my stay here in Zambia but Heather was unable to do the same; with significant sadness I dropped her off at the airport earlier this afternoon. And then there was one! Back at the hostel I was excited to receive a phone call from the Permanent Secretary at the Ministry of Education. His booming voice delivered the good news that our shipment had arrived in Lusaka and was currently being off-loaded from the truck into their storage warehouse. When I hung up I noticed the clock read 15:35. To the minute this was the exact time of our scheduled departure from the country. How ironic that the shipment arrived at the precise moment of our supposed departure, and the very moment Heather's plane was taking leaving the ground. Never mind the mind-bending coincidence, I'm ecstatic that I will soon be seeing the instruments again and I can finally deliver them to the kids that have been waiting so patiently. All that is left is for the Ministry to file some paperwork so the Finance Department can waive the duties; by Wednesday I should be in a truck with the load, heading to the schools. In the meantime I have several meetings booked with Ministry officials, shipping companies, local musicians and the national teachers college. All in the service of making the next shipment both more efficient and even more effective. We sit on the plane tired, cramped, and confident. Confident that we did everything we could to prepare for this trip, confident that powers beyond our control will favour us, and confident that nothing we need was left sitting on the coffee table at home. We will be traveling for twenty-seven hours and hope to hit the ground running. After spending August on vacation the few days at home before departing for Zambia were a flurry. Aside from the usual travel concerns of packing the bags and organising the cat sitter were extra chores such as checking on the status of our shipment, calling several offices in Zambia at odd hours to set up appointments, printing copy after copy of one form or another, and working out just who would be receiving all the instruments we have shipped to Lusaka. Internet is not as reliable or accessible in Zambia as we are used to here in the Canada so a lot of the schools and district administrators I attempted to contact were very slow to return the message. Fortunately responses began to trickle in and soon the emails were coming fast and furious. Time was ticking down so we tried to glean as much about each school's situation as we could from the other side of the world and we made our decisions accordingly. At this point our intention is to distribute the donated instruments to nine schools in four cities along the main highway in Zambia. Of course this being our first mission there are a lot of uncertainties lying ahead. Our first goal will be to meet with the Education Ministry and get the shipment released to us from customs. Then we hope to have a truck and driver made available to help us deliver the instruments before we pick up our head educator Susan Carlton who flies in several days after us. And then, at long last, this whole project will come together when we finally see a kid pick up a trumpet for the first time and blow into it. I can't wait; I'm sure it will be one of the greatest sounds I've ever heard. Phase I of IFA's first mission is now officially complete! On Monday, July 8th three shipping crates weighing in at 1,363 kilograms left Ottawa bound for Montreal. From there the load goes by truck to New York City where it will depart by ship on July 17th. The shipment will land in Durban, South Africa where it will be transported by train to Lusaka, Zambia with a scheduled arrival of September 1st. I can't tell you how happy I was to see it go! Getting this initiative off the ground has been a lot of work and has all but taken over the lives of myself and my fiancee, Heather. We could not have been so successful without the help of so many, and we are very appreciative for all the support. We are especially proud to thank the overwhelming generosity of the many donors who dropped off instruments, stands, books, and financial donations. Thirty-five guitars, more than a dozen keyboards, fifteen trumpets, eight trombones, two drum kits, twelve flutes, three French horns, forty-six recorders, violins, accordions, viola, bass, Irish whistles, electric guitars and amplifiers have been sent...the list goes on and on! We managed to collect hundreds of music books and boxes of scores and have shipped cleaning and maintenance supplies, picks, straps, sticks, instructional tapes and dvd's, metronomes, tuners, stands, extra mouthpieces, and no less than 1,900 brand new saxophone and clarinet reeds. Yes friends, 1,900 reeds. There's actually a fair chance that we thought of everything! There has been a vast amount of on-the-project training going on as the tiny IFA team mounted challenge after challenge. With every frustration came the realisation that everything will be so much easier next time! 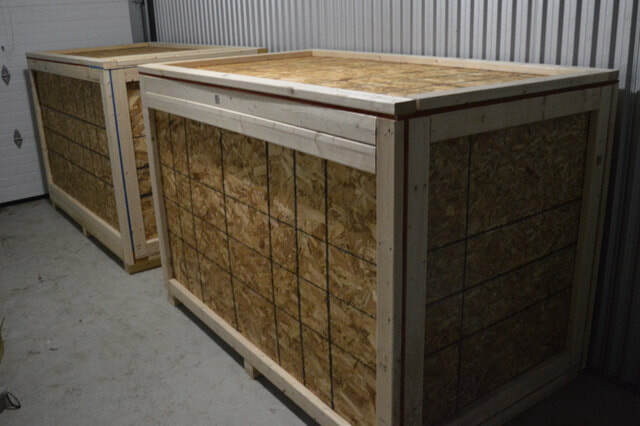 For example, did you know that to ship a wooden crate internationally the crate has to be made by a registered export-crate maker, and come with certification papers? Neither did we! While that problem got figured out in time we found out that truck trailers are standard 96” wide only as we were trying to load our 100” wide crate into one. You can bet we won't get crates made too wide again!. And that's two more hours of sweat and worry that can be avoided next time. The paperwork was a daunting task as well, and certainly another area where the next shipment will benefit from previous experience. In the end we have 3,000 pounds of great instruments and accessories headed to Zambia, where a lot of people will make great use of them. As we packed the crates my mind reeled with the vast possibility inside each instrument case. How many people will play their first note on this particular clarinet, how many will strum this guitar? How many lives will be brightened by this fantastic load of musical opportunity? Flights are booked* to coincide with the arrival of the shipment in Lusaka. Heather and I depart Ottawa September 3rd, and our head educator Susan Carlton will be joining us a few days later. We will spend a month delivering the instruments to several schools throughout Zambia and spending several days with each class introducing the new curriculum to the children and teachers. We're all very excited to see the project come full circle when we actually see the instruments in the hands of the children! Watch our website in September for on-the-ground updates. The very success of this project has driven up costs significantly. With every instrument donation the cost of accessories and shipping grew. At this point the project is running a $2,500 deficit, so any and all financial donations are still very welcome. Paypal donations can be made clicking here. And remember, this is our first of what we hope is many shipments, so we are still pleased to accept instrument donations as well. Drop-off locations can be found here. Thanks to everyone for their time, help, interest, and donations. Have a great summer. *None of the funds donated to IFA went towards flights and all personal expenses in Zambia will be paid out-of-pocket. Working in conjunction with the Zambian High Commission in Ottawa and the Minister of Education in Zambia we have determined that it would be best if our instrument donation coincided with the start of the school term in September. Rather than disrupting the music departments by introducing a full array of instruments midterm, this way the students and teachers can start a fresh curriculum with their new orchestra in place. Taking shipping time into consideration we will be sending two large crates of gear by sea, departing Ottawa on July 15th. This extra time presents us with the opportunity to collect more scores and educational material, more time to deal with the bureaucratic challenges of shipping a half-tonne of donated instruments to inland Africa, and a chance to collect even more instruments and have them serviced for the kids in Zambia. The next few months will also give us more time for fundraising. We have collected just over $2,000 so far through our benefit concert and paypal donations, which represents well over half of our needs. If you can help IFA financially, please click the “How To Help” tab at the top of this page. We certainly have received a wealth of instruments through the kindness of so many, and we'd like to extend our heartfelt thanks to those that have donated. We have easily collected enough to outfit three Zambian schools and have nearly enough for a fourth school, so keep those donations coming! While we still have not acquired any oboes or cellos (and we would be very happy to receive some! ), our focus now is on collecting full band scores. Playing music together in an ensemble is a very important part of the musical process, and performing concerts is the ultimate goal of any school concert band, and for that they will need ensemble scores. If you have any suggestions on how we could acquire ensemble scores for beginner and intermediate concert bands please let us know via the Contact page. The Ottawa Folklore Centre presents an afternoon concert to benefit the Instruments For Africa initiative. Ottawa's premier talent has banded together to raise funds for Instruments For Africa, an Ottawa-based initiative that sends musical instruments to needy schools in Zambia. 100% of proceeds from the concert will go towards shipping costs. Berekete Afrobeat Band is a 15-piece multicultural groove machine that has been getting Ottawa on the dance floor since May 2012. What started as a one-off tribute to the creator of Afrobeat and Nigerian political figurehead Fela Kuti at the Mercury Lounge - The Afrobeat Project - turned into a 7 month residency that has built a loyal following. Berekete Afrobeat Band is Ottawa's purveyor of the legendary West African sounds of the Afrobeat giants, with a blistering 5-piece horn section, soulful singers, with a monstrous rhythm section holding down the groove. For the IFA benefit concert, Berekete Afrobeat Band will present dance music by Mr. Ebo Taylor, considered to be the current living master of Ghanian style Afrobeat. Along with 9 European tours, countless awards including a Juno, national status in Canada and now 6 albums under his belt, Tony D has established himself as a player and performer who delivers the goods. When he was 19 years of age, Tony had the pleasure of performing with the legendary Buddy Guy, starting a trend that would see him share the stage with such greats as Luther Allison, Bryan Adams and Michelle Shocked. A consummate performer, Tony D has supported the likes of both Stevie Ray and Jimmie Vaughan, Albert Collins, Robin Ford, Robert Cray, Koko Taylor and The Doobie Brothers. Local hotshots Tindervox have been extremely busy stamping their brand all over town, consistently playing Ottawa's elite venues and capturing audiences with their sublime and thoughtful sonic approach. Soaring vocals from singer/songwriter Kara Askwith confidently blend with spidery guitar lines courtesy of stellar guitarist Justin Black. The tall talents of Tiff Robson completes the local trio's accomplished lineup. Completing the roster for the IFA benefit will be Burnt Reynolds, a country-tinged acoustic duo that features the blistering guitar work of Doug Gouthro, formerly of The John Henry's, and the founder of the Instruments For Africa initiative, Todd Snelgrove. IFA would like to acknowledge the generous support of RBC Royal Bank Bluesfest and Stella Luna Gelato Cafe. It's been two months since the IFA initiative began, and we've already collected almost 100 instruments for needy children in Zambia! Flutes, trombones, guitars, recorders, french horns, clarinets...almost everything has been serviced and is ready for shipment to Africa, and instruments, sheet music, stands and accessories continue to pour in! At instrumentsforafrica.com you can follow the progress of this exciting project! Read the story that started it all, follow regular news updates, find links to our sponsors and our facebook page, and most importantly find out how you can help! IFA has met a lot of success in a short time! We've sat down with the Zambian High Commission and they are eager to help make our shipment a success. The variety of instruments we've received so far have expanded our goal beyond the Linda School. Our initial shipment of instruments will now be going to at least three schools and we will be working in conjunction with the Minister of Education in Zambia to select the most appropriate schools to receive the extra donated materials. While we have negotiated a drastically discounted rate with an international shipping company there will be significant costs involved in getting all of this gear to Zambia. A benefit concert is being organised in Ottawa to help defray these costs. We're working on a great lineup and are excited for a great show! So be sure to bookmark instrumentsforafrica.com and check in often for updates and concert details!